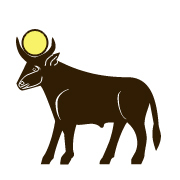 Today’s card is Mnevis, the sacred black bull that represents both HetHer (Hathor) and the Nile river. In ancient times, the Egyptians selected a perfect bull which they treated with the greatest respect. At the appointed time, this bull was sacrificed so that he could take with him to God all the messages, prayers, and requests of the pharaoh, the priests, and the people. Mnevis asks you, if you were to have an appointment with God personally, what would you ask for? What is on your heart to tell God? What do you want God to know about you? Happily for the bulls of today, you can go directly to God in prayer. Do it now and start a conversation!